Whether you are sick, or you ate too much, have motion sickness, have terrible anxiety, or more, nausea is one of the worst feelings. The persistent queasiness can be hard to live with, and if you don’t have the luxury of taking time off of your busy life to sleep off the nausea, or if sleeping does not help the nausea, you have to find a way to deal with it. However, rather than trying to simply push through the ill feelings, you can use essential oils to help cure your nausea. One of the biggest advantages to using essential oils for your feelings of nausea, is that they are all natural. They are made from various plants and materials found in nature, which means that our bodies can more readily digest them and utilize them within our functions. You do not have to take any medications or put harmful chemicals into your body, using the many functions of essential oils instead. They are completely safe to use, with no risks of getting incorrect doses or harmful side effects. With essential oils, each one can serve multiple purposes, so if you have a basic collection, you can solve almost any problem that you have. Peppermint is perhaps one of the most common essential oils used, and is commonly used to help treat nausea. One of it’s primary uses is to aid in digestive functions, providing support. In this purpose it can also ease stomach aches, release tight muscles, and decrease feelings of nausea. There are many ways that you can apply this oil, the easiest being placing a few drops onto your chest and rubbing it in, or placing it in an oil diffuser to spread throughout the room. Just as many people will drink ginger ale when they have a stomach ache, ginger is one of the best essential oils to use for nausea. It treats nausea, and calms upset stomachs. It can also help with overall digestion. An effective combination of lavender, peppermint, ginger, and grape seed oil can be massaged onto your abdomen. This will then seep into your skin, helping to ease the stomach ache and reduce the nausea. It can also be added to an oil diffuser for those who prefer this method of oil distribution. Either option will be effective. Cardamom may be more difficult for certain users, due to their own personal preferences and dislike for the flavor and smell, but it can be one of the most effective essential oils for nausea. Similarly to ginger and peppermint, cardamom eases stomach pain and calms upset stomachs. Since it is such a strong smell, and can be very overpowering for some users who are more sensitive to smells, it is best used when combined with other oils. 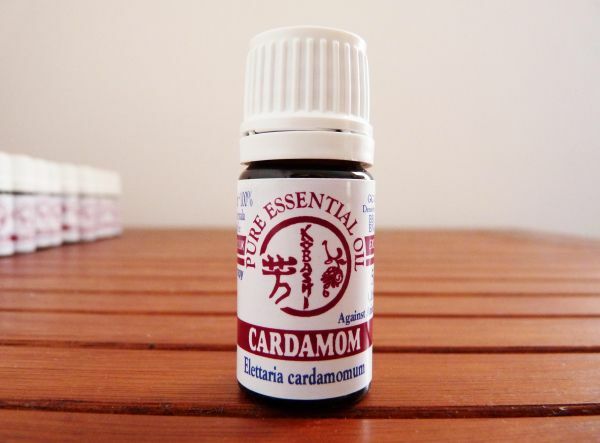 A popular mixture is cardamom, bergamot, grapefruit, geranium, and spearmint. This combination of essential oils can be used as massage oil, or it can be placed in a diffuser. Nutmeg is probably most commonly thought of in baking, adding a particularly nutty and delicious flavor to many bakes. 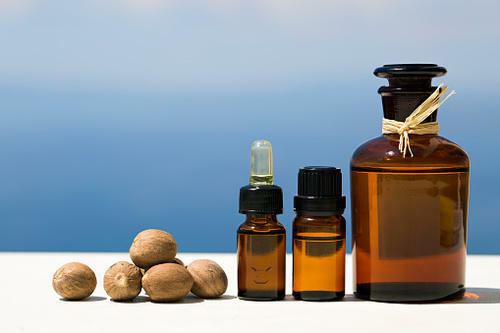 However, nutmeg essential oils can help treat a plethora of stomach problems as well as digestive problems. It’s primary purpose is calming stomachs, including reducing the prevalence of nausea and queasiness. For those who have an oil diffuser, it is best used here. Just a few small drops are needed. However, if you do not have a diffuser, you can place a few drops onto your stomach or chest, which will still be effective. In the world of essential oils, lavender is perhaps the most well known and well used. It is a very calming and balancing oil, and has numerous uses for the human body and more. In terms of nausea, lavender’s calming and balancing properties are helpful in dealing with the causes of nausea, and calming the stomach from whatever has upset it. There are numerous ways of using it, from massaging it onto your stomach and abdomen, putting into an oil diffusor, or putting it into an oil mixture. However, one of the most effective methods of calming nausea is to place several drops of the oil into a bath with Epsom salts. As we know, it is not always the classical medicine can offer effective and safe for health treatments. The use of many drugs spoil the immune system, antibiotics impair intestinal microflora. In many cases you can get a more lenient method in relation to their own health, proven by the nature and long-term experience of our people.